What would a world be without a sun? More importantly what would our world be like without the sun? Have you really thought about it? Sure it would be a dark and cold place but more that that we would not exist, not as we know it; and now we would probably not survive at all since we are more dependent than ever on the sun. We depend on our sun for light, to create our climate and so much more. Our rain depends on the sun. Without rain and sun we would not have plants and trees; we would not have crops and food. Sure we have started to make food in laboratories but I would much rather eat something that has grown naturally. Other animals could not survive either, we all need food and the sun helps facilitate the conditions so we humans can survive on this planet we call earth. One of the amazing things of our evolution (or creation) is the human brain. Humans have always been curious about our natural world and the cosmos we can see. We have had fundamental questions such as: Where did we come from? Are we alone in the Universe? How did this whole thing come about? And while we know much about it all, there is still much more to know. I don’t think we will ever know it all and that is a beautiful thing; it is not going to get boring. The disappearing of the sun if for only a few minutes caused fear in our ancestors. The Greeks and the Romans revered and worshiped the sun god, today we are fascinated by it. 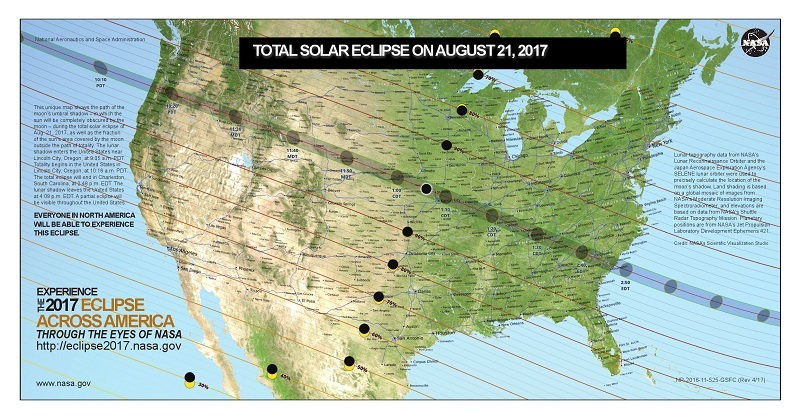 The upcoming Total Solar Eclipse on Monday, August 21 is an amazing celestial event, one not to be missed. Our area (Maryland) is not in the path of totality (when all the sun is eclipsed by the moon) however we will have 83% obscuration and that is pretty good. The photo below shows what our area (Ellicott City) will see at maximum obscuration. If you want to see how other cities and towns in the country will see the eclipse, I encourage you to look at this eclipse animation, it is very interesting. I also encourage you to look at the NASA website, it is a tremendous site for information. 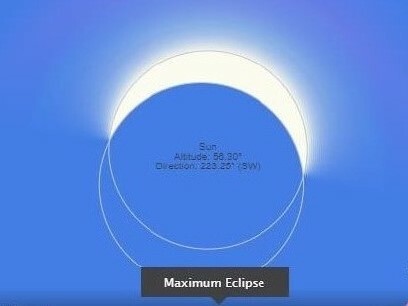 And you can also follow the eclipse via Live Stream. thanks to modern technology. Lucky for the USA, there will be another eclipse in April 2014 that will cross the country from north to south. If you want to see that one, you better start planning for it now and make your hotel reservations, I am almost kidding. May the weather be clear and the Sun be shining in the sky on Eclipse Day for everyone in the path of totality.